Not so long ago, on August 8, was an international day of cats, and it is possible that some caring hosts decided that day to present nice gifts for their favorites. Usually in such cases as a present speak a variety of goodies, or fun toys for pets. But especially attentive and loving owners certainly would not refuse to please yourself and your pet an original piece of furniture, the design of which is responsive to the needs of not only the man but also his cat. All cats love to rest, without exception, in a safe, in their opinion, shelters: in closets, shelves with laundry and other secluded places. 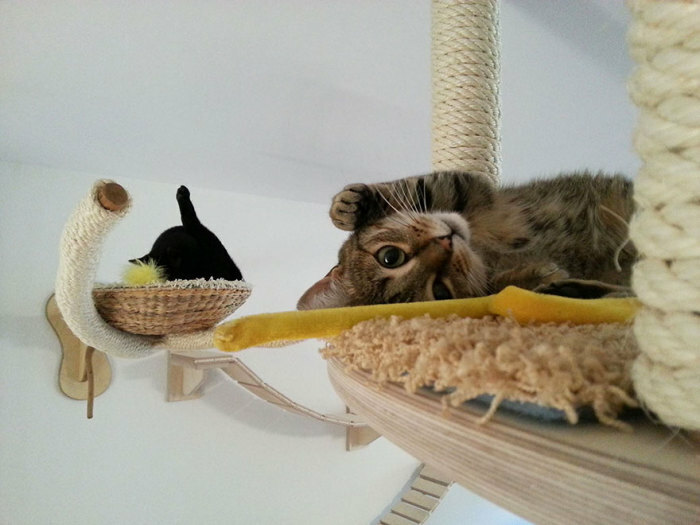 Furniture with a specially provided for pets ladders, minks and secret passages can be unusual and at the same time a functional element of the interior, which will be useful not only for the owners of the apartment, but also for their pets. 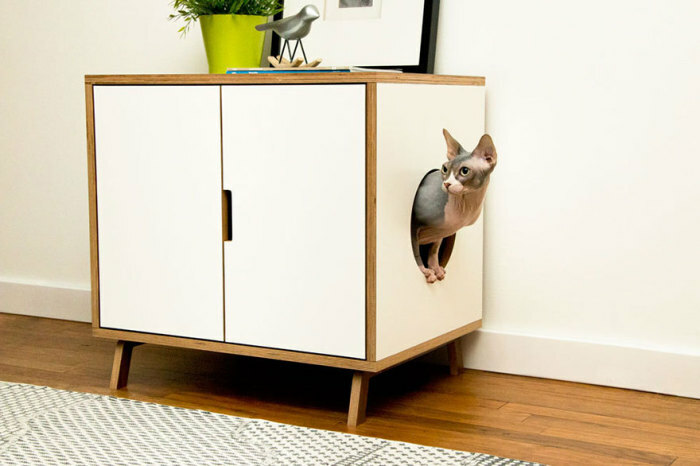 Below is a fully functional 25 pieces of furniture that is definitely going to enjoy any house cat. 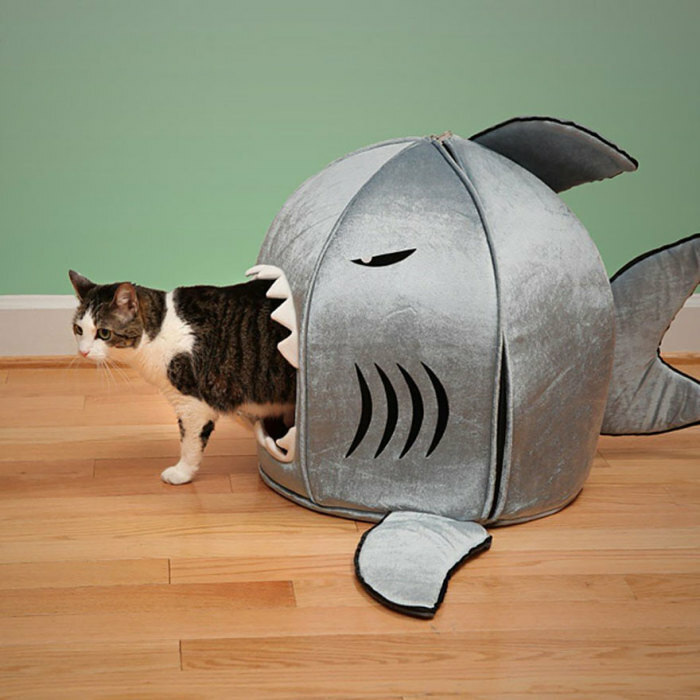 Funny cat in a house for a shark. Funny little house for the cat as a toy shark will be enjoyed as the mustachioed pet and its owner – Fans of the original and hilarious gizmos. This bed for the cat. In this elegant bed any mustachioed pet will feel a full member of the family, which is surrounded by affection and care. 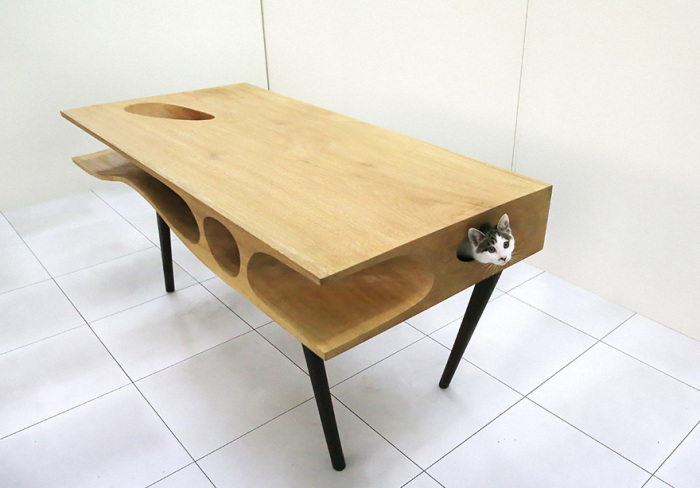 Table with a tunnel for cats from LYCS. 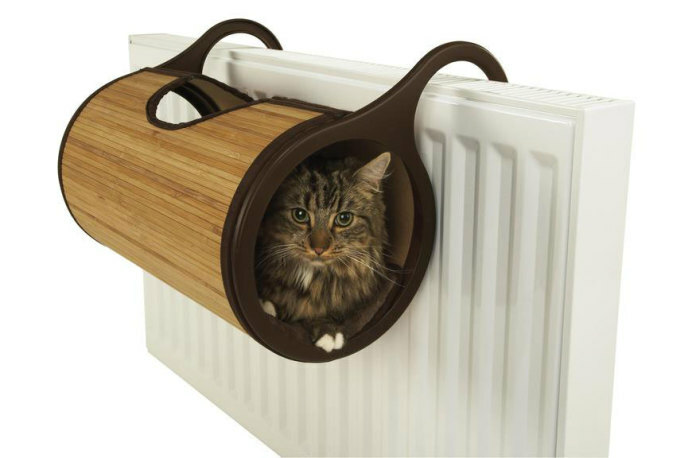 Unusual table – this is not only a functional piece of furniture, but also a mysterious tunnel that will delight any cat. Table with a green lawn in the middle of Emily Wettstein. The original table with a small green meadow in the middle will not only be a spectacular piece of furniture, but also fun golf games pet. 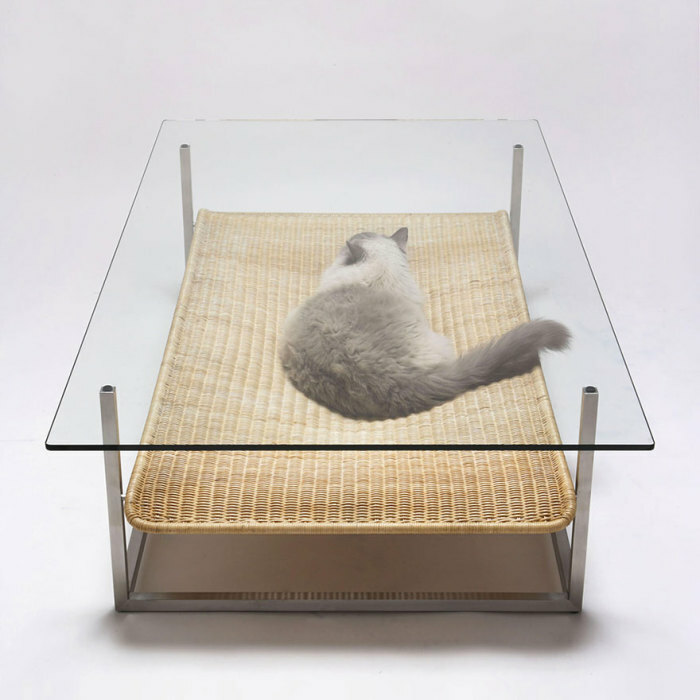 Coffee table with a hammock by Koichi Futatsumata. 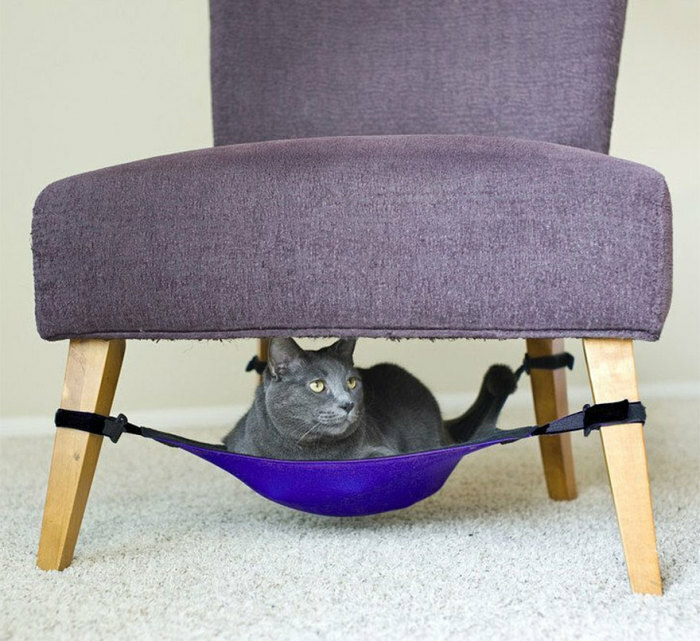 Small glass table is equipped with a unique elastic hammock for rest mustached favorite. 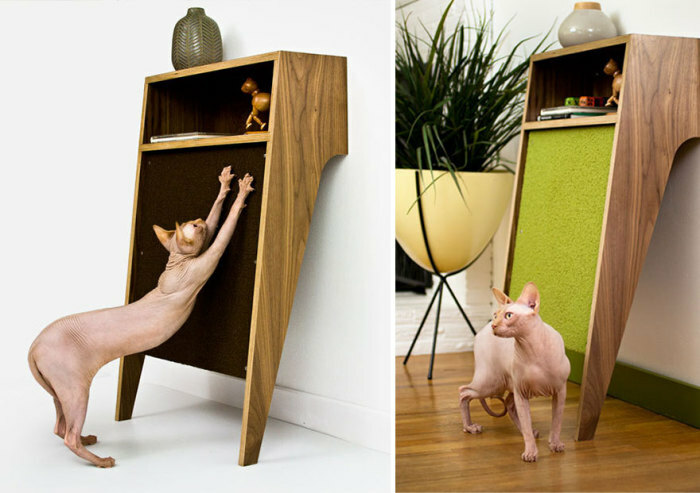 Dresser with access for the cat from modernistcat. Stylish dresser with special holes for the cat is not for storing linen and things, but for a relaxing holiday pet. Wall home for the cat from CatissaCatTrees. 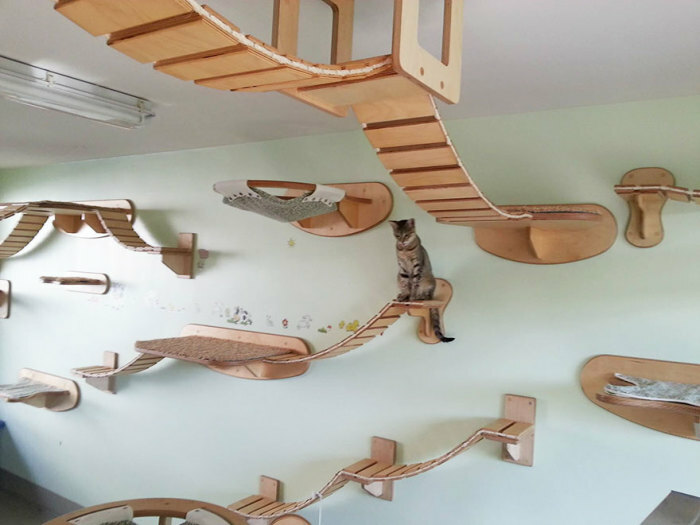 The original design for cat games attached to the wall, and therefore does not take up much space. 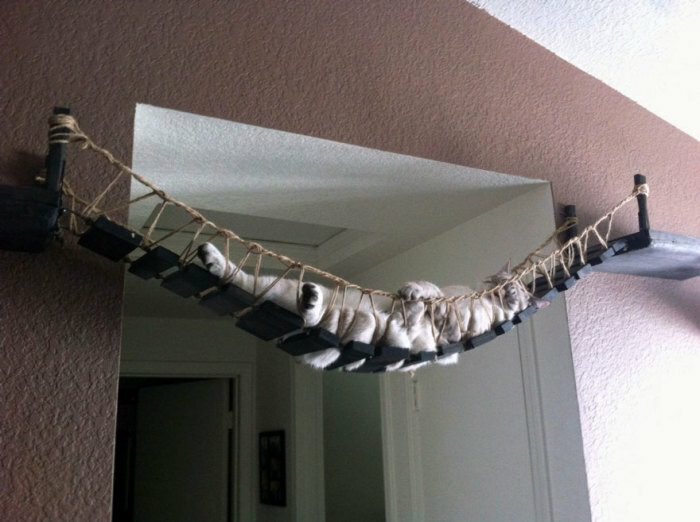 Hanging a hammock – a real dream of any domestic cat. 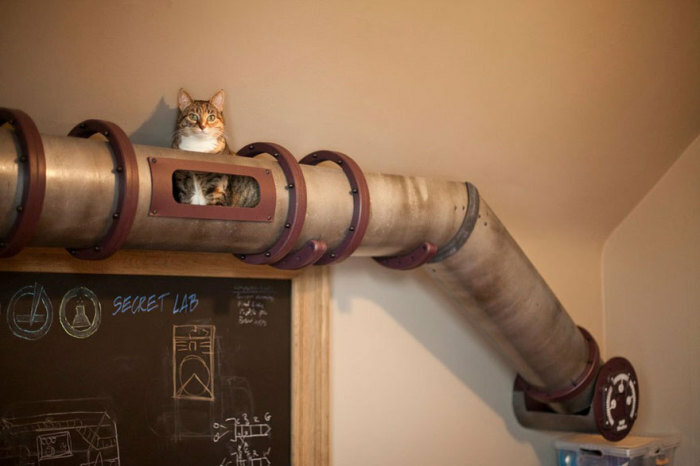 Cat’s tunnel in the form of an old tin pipe from Because We Can. 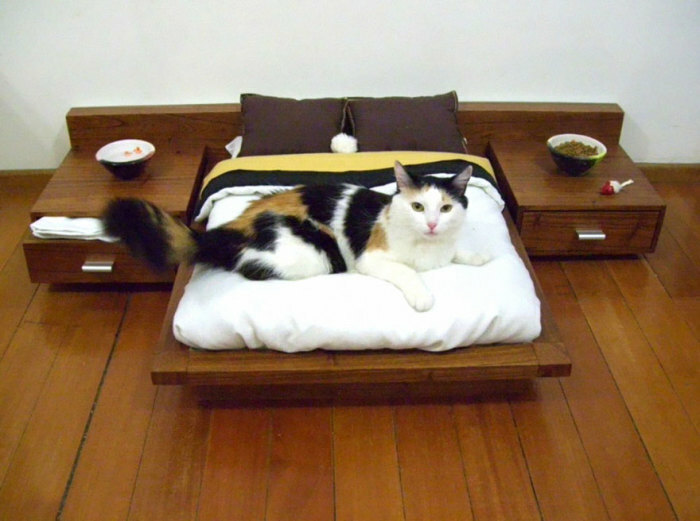 Furniture for a pet cat may well be an original addition to the interior of the room. Bookcase with a ladder to the mustachioed pet from Corentin Dombrecht. 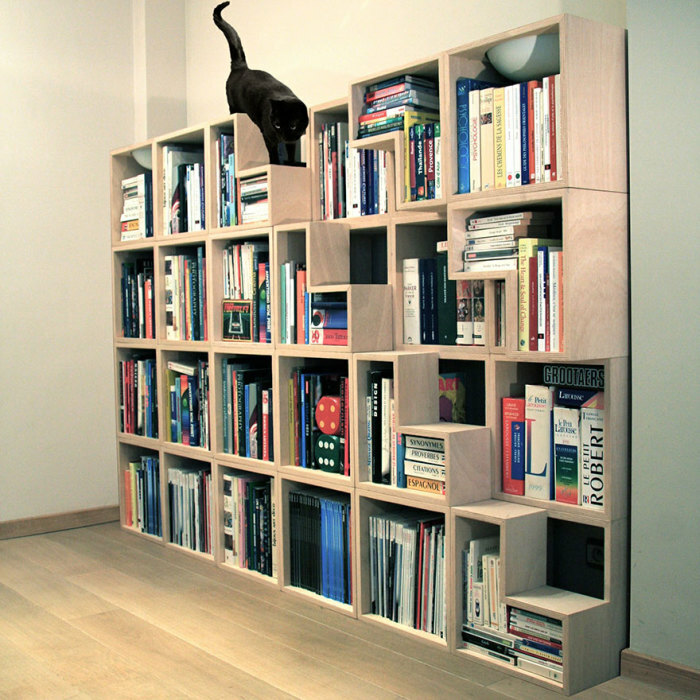 Unusual bookcase with ladder – the best option for the amateur furniture cats. Nightstand with the passage for a pet from elipsdesign.com. Nightstand with the passage Pet – original piece of furniture, which takes into account the needs of humans and animals. Cushion for cat from Petz Route. Unusual theft – is not only original element of the decor, but also a fun toy for a mustache pet. Armchair with a hammock for cat from catcrib.com. Any seat at a fairly high legs may well be converted into extra seating pet. 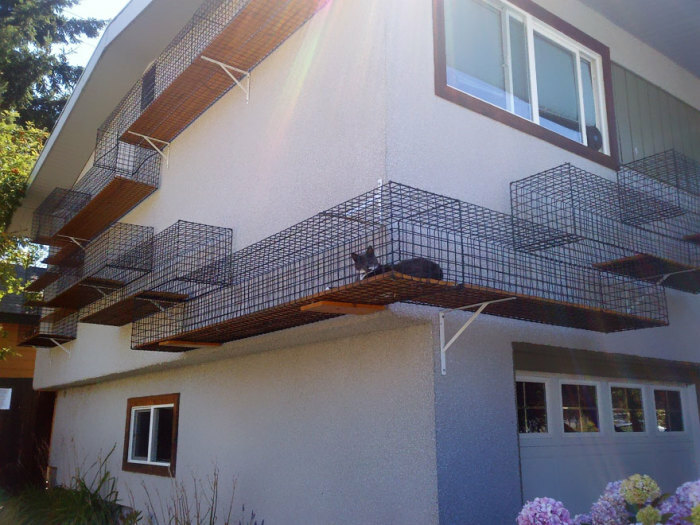 Network cat tunnels, literally enveloping the House, will love the owners of several cats. Original sharpener claws from SouthPawCats. Ordinary sharpener claws may look like a spectacular piece of decor. Another option unusual sharpener for cat claws from modernistcat. The modern model of the cat’s nail sharpeners sure to please both the owners and their pets. 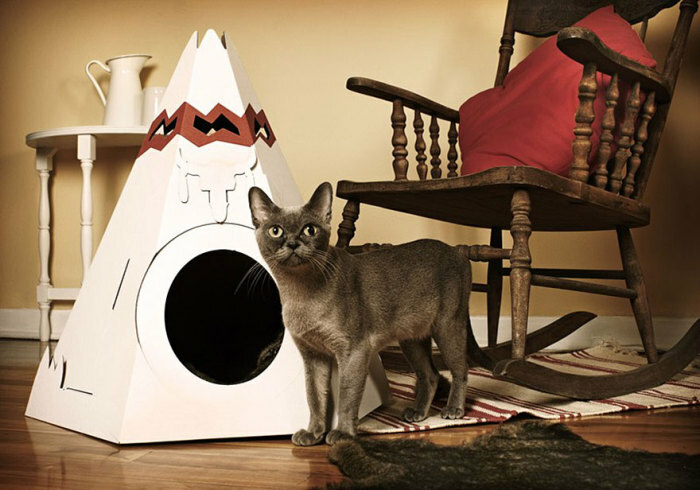 Feline wigwam from Loyal Luxe. 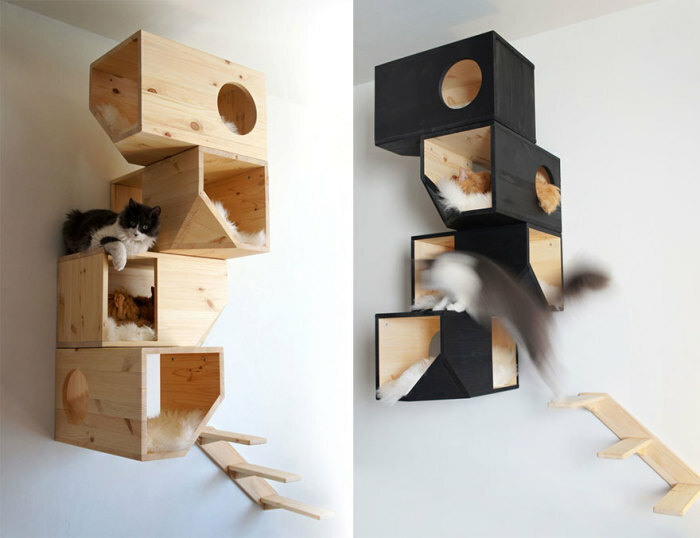 Modern designers offer a variety of models of the cat houses. Cheerful wigwam – the original and stylish option of personal space for the cat. Bedside table with a place for a mustache pet from Pousse Creative. 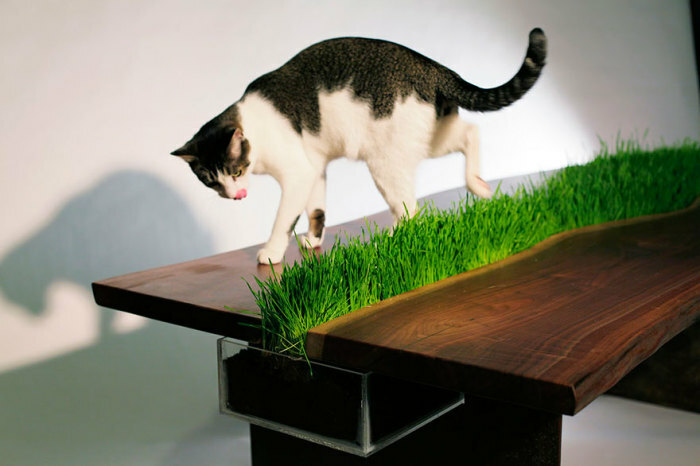 Unusual bedside table – a place to stay a pet and a stylish piece of furniture. Nightstand with hidden cat postelku from THE9LIFE. 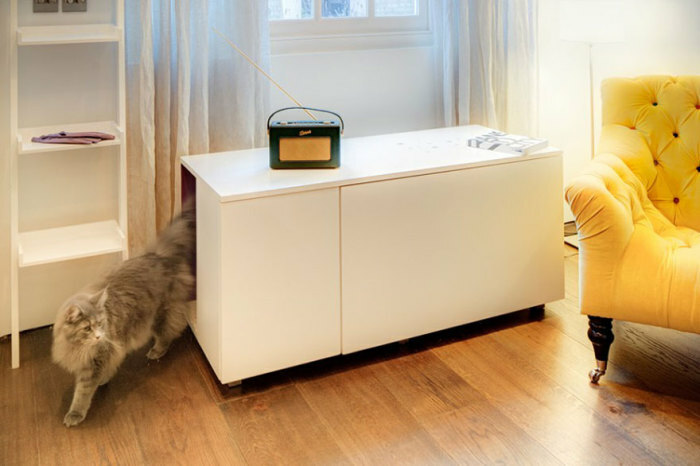 Original cabinet not only to decorate the interior, but also become a destination for a four-legged pet. Sofa with tunnels for cats from Seungji Mun. Upholstered furniture and thoughtful specifically for cats moves – an ideal alternative for the owner and his pet. Chair for the cat and its owner from Paul Kweton. 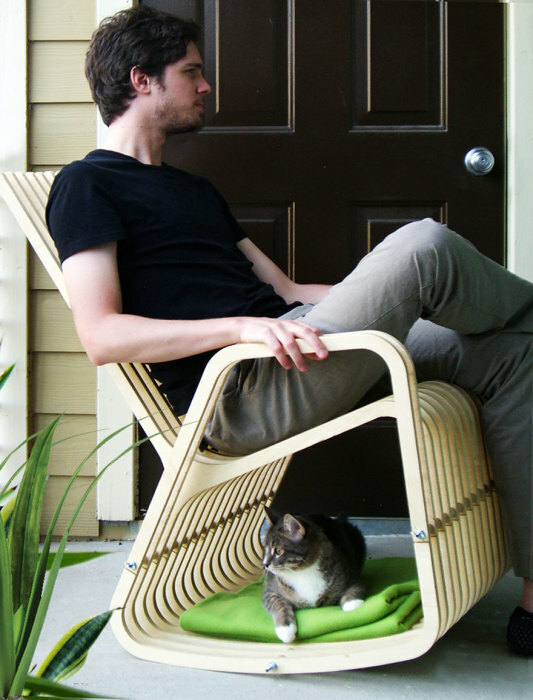 Funny chair – resting place for your pet and its owner. 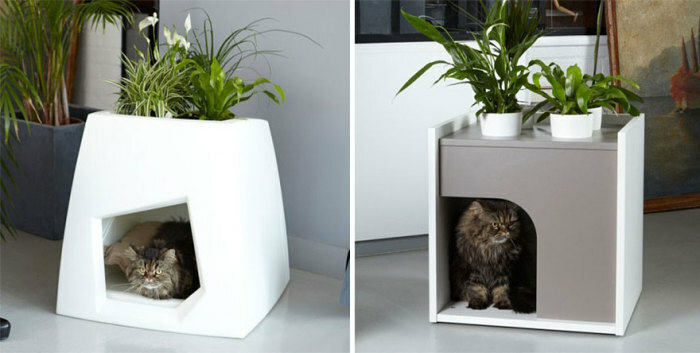 Unusual cots for mustachioed pet is attached to the battery, thus helping to save space in a small area of ​​the room. 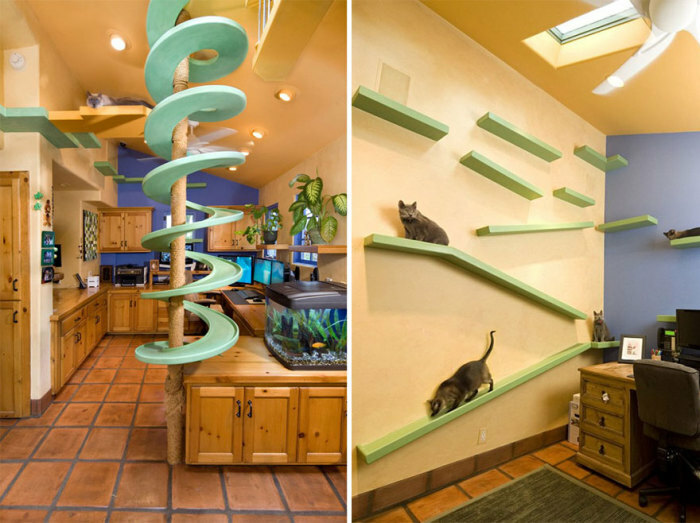 Cat slides from Trillium Enterprises. Issued the apartment relaxing entertainment for the mustachioed pet can create a real mini-amusement park. Games panel designed specifically for four-legged friends will be chic gift favorite. Original cat house from Pei Pod. Unusual cat house – an extra bed for a mustache pet and stylish decor element. furniture that meets the needs of not only humans, but also the needs of his four-legged friend, be sure to be interested in the defender of animal rights.